For this month’s mindfulness challenge, I am doing Mindful Eating II: Meatless March. This is less an effort about specifically giving up meat since I don’t feel particularly dependent on it (especially when M is out of town), and more an effort to continue to venture into new recipe worlds and expand my go-to repertoire. Last month I made a delicious sweet potato lasagna out of the fantastic cookbook I got for Christmas: Run Fast, Eat Slow. Although I would love to share these recipes with you, as the authors do not make them freely available online I don’t feel I should either. I can say that 100% of the recipes I’ve made from it are just absolutely fabulous, and I highly recommend you buy it. I’m not affiliated in any way, just a super huge fan! 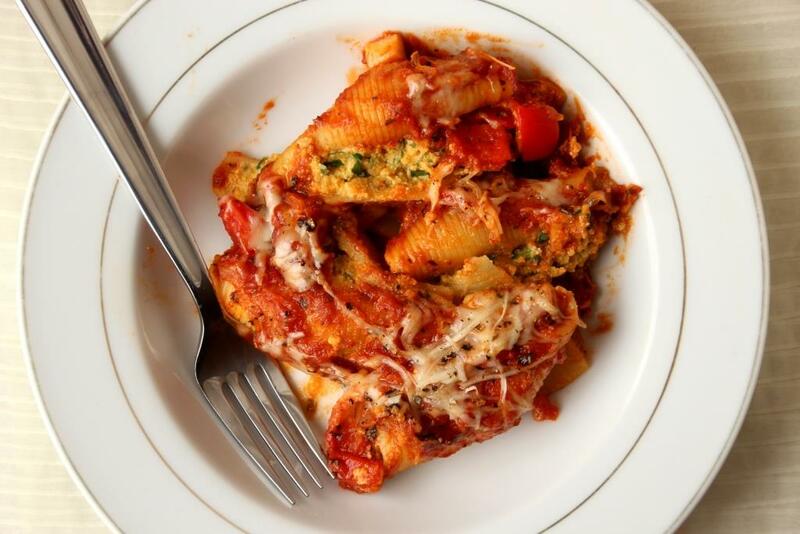 In any case, inspired by the sweet potato ricotta mixture that made up one of the lasagna layers, I created a meatless dish with similar flavors. 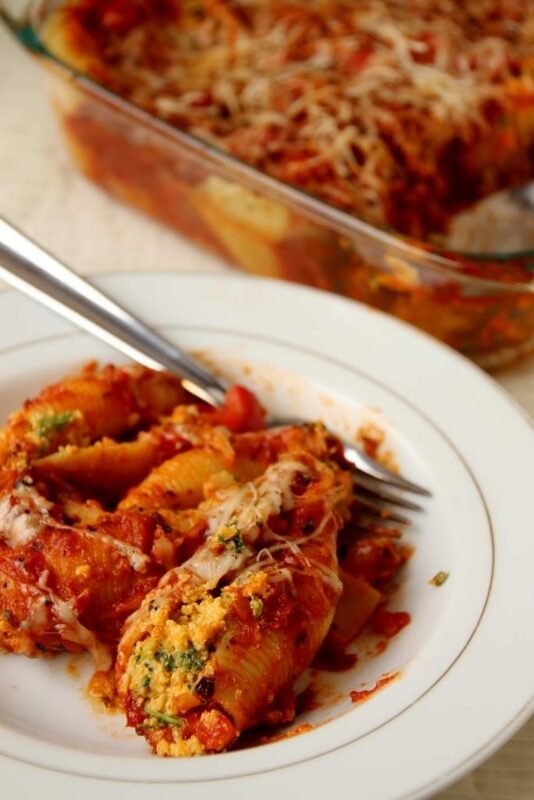 I’ve always been intrigued by those jumbo pasta shells and often see recipes in my Pinterest feed, but somehow have never actually made them. I determined now was a good a time as any and set out to make sweet potato lasagna shells. Sweet potato, ricotta, and spinach make a glorious filling, surrounded by a typical but delightful spaghetti sauce. You can never have too much cheese so some shredded Parmesan graces the top of the dish. The finished product is creamy and a fun mix of sweet with just a little spice from the sauce, which makes it a great way to jazz up an otherwise traditional pairing. I used a convenient jarred sauce as I was crunched for time, but this would be extra delightful with your favorite homemade version. Extra diced and sautéed veggies, a little crushed red pepper, a splash of red wine, and you’re good to go. 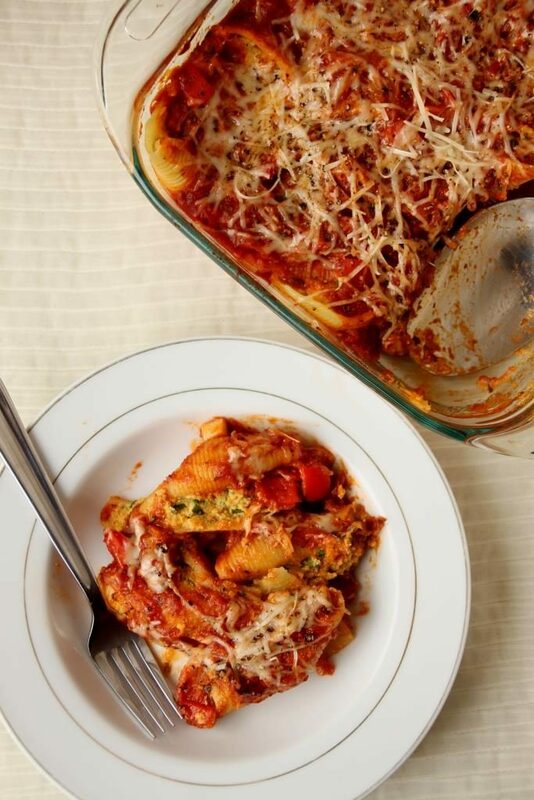 I decided I didn’t want my shells to be drenched in sauce, but if you like alllll the sauce then definitely use the larger end of the range listed in the recipe. My friends know I could eat sweet potatoes all day every day, but I have to stress this is probably one of my new favorite dishes. I split my recipe into two 8×8″ pans and placed one in the freezer to bake later, and I’m already excited to have it again. It reheats great for leftovers and goes excellent with a side salad or roasted veggies. 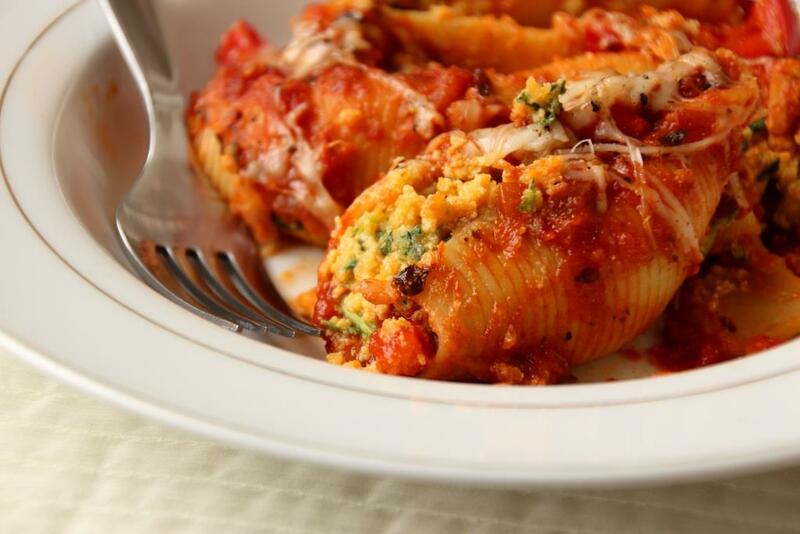 This is a slightly time-consuming meal since you have to cook the shells and stuff them before baking the whole shebang, but it can be made more weeknight friendly by making the filling and the sauce ahead of time, or even assembling the dish completely and refrigerating until you’re ready to bake it. This may increase the baking time a bit so make sure you check the shells are heated through. And just in case the crew you’re feeding can’t possibly give up meat, this dish would be excellent with some diced bacon or your favorite ground meat in the sauce. Cook pasta according to package directions, 1 minute less than al dente. Drain, rinse in cool water, and set aside. Meanwhile, heat olive oil in a large pan over medium-high heat. Add onion, bell pepper, and garlic and sauté until onions are softened and translucent. Add spaghetti sauce, red wine, and pepper flakes reduce heat to low, and simmer for at least 10 minutes. Meanwhile, mix together sweet potato, ricotta, spinach, and eggs until completely combined. Transfer ricotta mixture to a large Ziploc bag and snip a 1/2″ slice off the tip. Stuff shells with the filling, about two tablespoons per shell. Spread about 1 cup of sauce on the bottom of a 9×13″ baking dish. 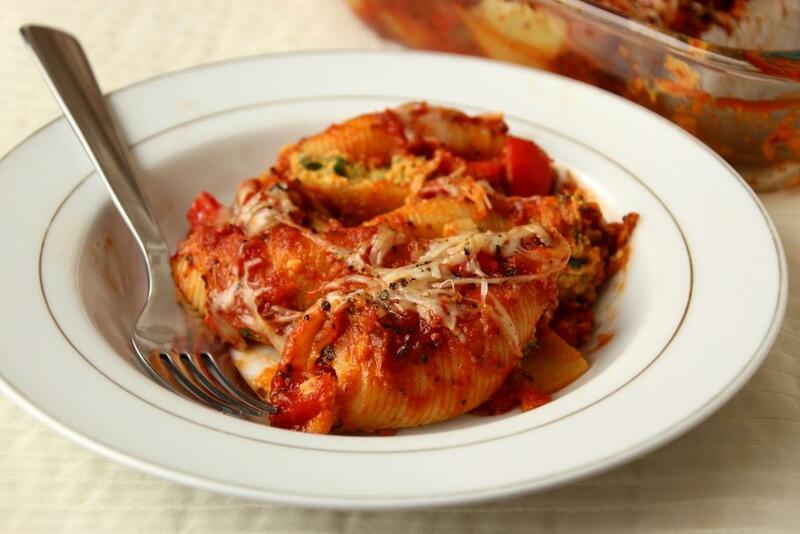 Spread remaining sauce on top of the shells and sprinkle evenly with shredded cheese. Add freshly ground pepper, to taste. Cover pan with foil and bake until sauce is bubbly, about 30 minutes. Remove foil and bake an additional 10 minutes, or until cheese is melted and lightly browned. 1 If you’re feeling omnivorous, some bacon, pancetta, or Italian sausage would be great additions to the sauce. 2 If you’re vegetarian such that you don’t eat eggs, you can just leave these out. The texture will be a little different (a bit runnier) but the flavor will still be great.